Let me share with you my latest discovery! While shopping at the Rockwell Moonlit Bazaar last month, I chanced upon a booth selling packs of grains and dried herbs. 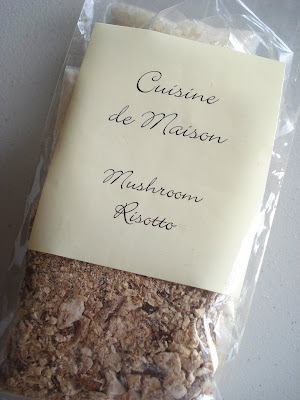 Looking at it closely, the package says Mushroom Risotto. Hmm.. interesting. I turned the package and read the step-by-step procedure, looks pretty easy to do. I couldn't resist and bought myself a pack to try. 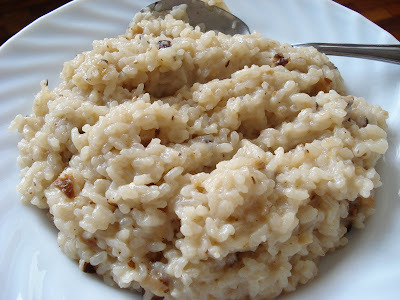 Finally, a couple of weeks after Christmas, I decided to try this interesting instant Mushroom Risotto and see if it can definitely satisfy one's sudden gourmet Italian craving. To make it extra yummy, I sprinkled some Parmesan cheese before serving. The verdict: It surely was a hit with my family particularly with my sister! While it may still need a little more experimenting to get the authentic feel, it can definitely be an instant solution whenever you just want to add an Italian feel to your meal. To order, contact Cuisine de Maison at 0916-2269800.
as long as its s hit, then its great.